Since the role of the jaw bone is to support the tooth, it loses its function with the loss of the tooth itself and starts to retract. This may cause the recession of the jaw and change the structure of the face. The bone graft is an act of increasing the volume of the bone which is the most often performed in order to allow the implant placement. This procedure allows creating a sufficient bone volume that will ensure the long term implant-supported teeth restoration. It takes from 30 minutes to 3 hours and is generally performed under the local anesthesia. 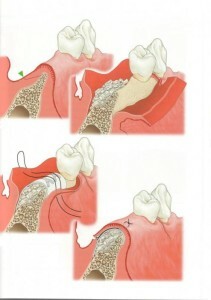 The healing time is about 3-9 months and afterwards the implant placement can be performed. If the bone loss wasn’t significant than is possible to perform the bone graft at the same time as an implant placement.